NEW DELHI, APRIL 17: Bihar allocates 6.8 per cent of State Domestic Product (SDP) to education, while Gujarat spends least at 1.8 per cent only. With blurry regulations and centre-state issues, the cost of education in private schools in some of the states is as high as 20 times compared to public schools, putting a huge financial burden on parents. 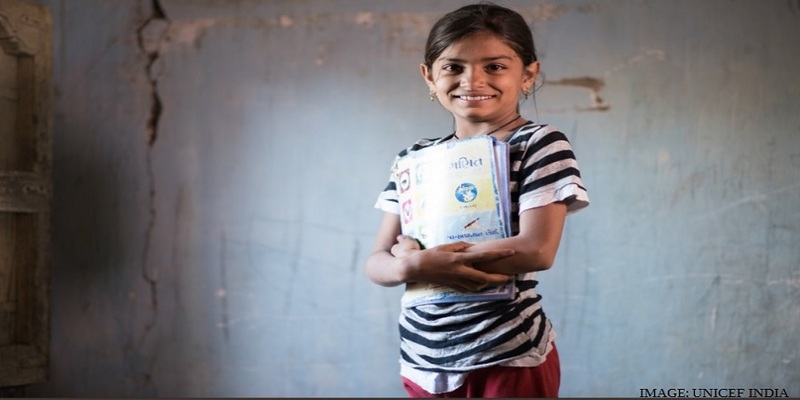 At the national level, the government (Centre and State, and across all levels of education) spends around 4 per cent of GDP on education, are some of the key findings of ‘State of Working India 2019 Report’ published by Azim Premji University. In all states, private schools were more expensive than public, although the extent of disparity varied greatly across states. In Kerala, for example, private schools cost five times more than the public, while in Andhra Pradesh they were twenty times more expensive. In 1976, education was moved to the Concurrent list of subjects, and the allocation of resources and expenditure became a shared responsibility of the Centre and states. The Centre devolves a certain share of its revenues to the states and the latter may also have their own sources of revenues for financing education. In 2015-16, the total budget provision (revenue account) of Education Departments at the Centre and states amounted to Rs 4,33,342 crores. Of this, about 80 per cent was for states and Union Territories. Across states, there is considerable heterogeneity in the allocation to education. As stated in the beginning, Bihar spends around 7 per cent its SDP to education, well above the national average of 4.1 per cent, and that of other higher income states such as Kerala (2.7%), Tamil Nadu (2.1%) and Gujarat (1.8%), as per MHRD 2016 data. “Poorer states like Bihar and Assam will show relatively high shares due to their GSDP being much lower in comparison to richer states like Tamil Nadu or Maharashtra. The absolute spending per child in these latter states will be much higher,” the Report reads. In 2014-15, Uttar Pradesh and Bihar had amongst the lowest expense per enrolled student (Rs. 7,613 and Rs, 9,583). A smaller state like Goa spent the highest, Rs. 67,041 per enrolled student. All southern states spent well above the national average of Rs. 13,974. Kerala and Himachal Pradesh spent among the highest per student, and also performed well above average in learning outcomes in English and Math. On the other hand, states like Bihar, Madhya Pradesh, Uttar Pradesh and Assam spent the least per student in public schools, and the learning outcomes were among the lowest in the country. “West Bengal and Orissa are states which have been able to achieve relatively high learning outcomes with only moderate spending per student. Recall that these two states also featured as having better than average health outcomes given lower than average NSDP,” it says. Another interesting finding of the report is a significant difference in the learning outcomes between private and public schools. On average, twice the number of students in private schools were able to achieve basic reading/math comprehension compared to students in public schools. This number also varies from state to state, in states like Madhya Pradesh, Bihar and Uttar Pradesh, private schools had four to five times more success in achieving basic learning outcomes. On the other hand, in states like Andhra Pradesh, Karnataka and Punjab, outcomes were broadly similar between private and public schools. Contrary to the popular belief, in states like Maharashtra and Tamil Nadu, public schools fared better in reading achievements compared to private schools. The Report reads, “The National Achievement Survey (2017) also confirms that these two states achieve learning outcomes above the national average. This survey includes both rural and urban government and government-aided schools. But these two states are exceptions and in most instances, public schools have failed to provide quality education to their students. While private schools show better learning outcomes, most poor households cannot afford private education. Out-of-pocket expenditure by households in an academic session on a student at primary level was Rs. 1,111 in government institutions compared to Rs. 10,623 in private unaided institutions. On average, primary education in public schools cost only one-tenth of the cost of primary education in private schools. The Kothari Commission Report around 50 years back, in 1966 recommended increasing the educational expenditure to 6 per cent of national income. Education has an instrumental value, improving health, expanding opportunities and labour productivity and hence earnings. It has multiple neighbourhood benefits, enabling greater democratic participation and transforming of societies. Besides this, the attainment of learning has an intrinsic value in itself, being transformative and emancipatory. 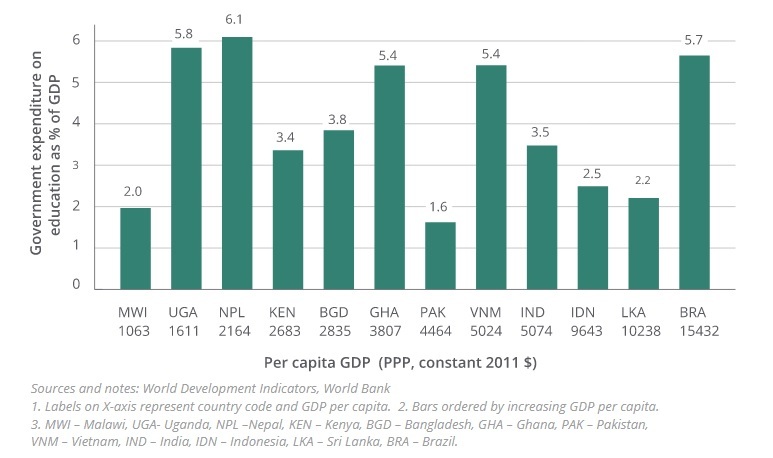 Countries similar to India in terms of per capita GDP, population size and population density have been spending on education around 5-6 per cent. In the last two decades, the highest government expenditure on education as a share of GDP was 4.4 per cent in 2000 even as other developing countries have either gradually increased education expenditure over time (Nepal, Indonesia) and/or spent a considerably higher share than India (Brazil, Malawi). Despite low and stagnant levels of expenditure on education, India’s literacy rates have steadily risen over the years, increasing from 18.3 per cent in 1951 to 72.1 per cent in 2011, according to Census reports. Enrolment rates have also risen and gross primary enrolment rate was 84 per cent in 2016-17 (NIEPA 2018). In 2014, nearly 93 per cent of rural households had a primary school within one kilometre of their house (NSS 2014). Therefore, in terms of coverage and reach, educational outcomes, particularly at the primary level, have improved gradually over the years.